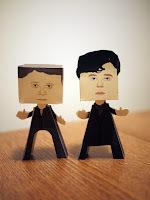 These paper people are from the Sherlock TV series, the papercrafts are designed by sally. Sherlock is a British television series that presents a contemporary update of Sir Arthur Conan Doyle’s Sherlock Holmes detective stories. It stars Benedict Cumberbatch as Sherlock Holmes and Martin Freeman as Doctor John Watson. After an unbroadcast pilot in 2009, the first series of three 90-minute episodes was transmitted on BBC One and BBC HD in July and August 2010, with a second series of three episodes first broadcast in January 2012. A third series has been commissioned and is scheduled to begin production in early 2013. The series has been sold to over 180 territories.